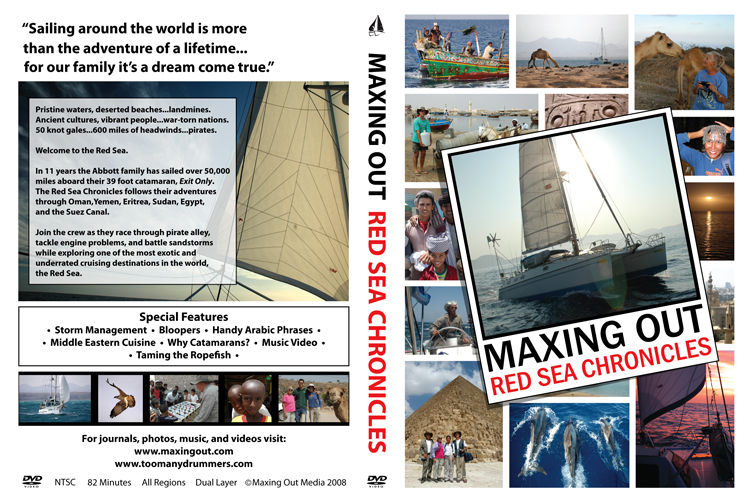 Cruising up the Red Sea gives you lots of opportunities to get up close and personal with camels. Our first interaction with them happened in the mountains of southern Oman. 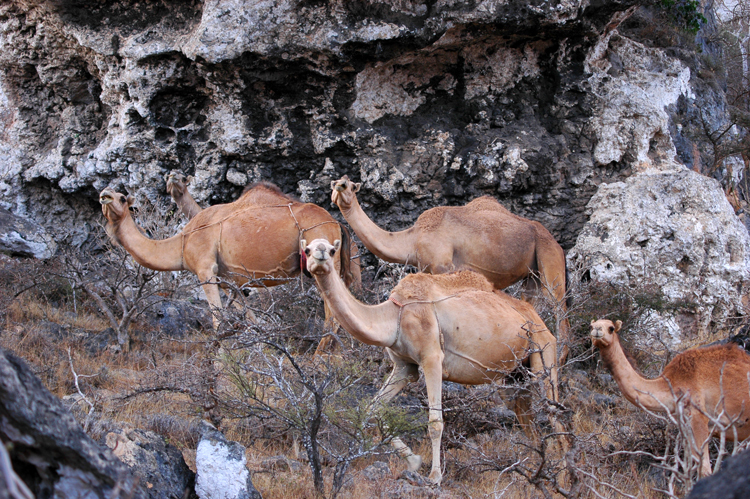 Most camel herds wander through the mountains untended. At the end of the day a herder rounds them up and returns them to the safety of camp. About three hours south of Salalah heading toward the Yemeni border, we came upon a herd of camels wandering in the road. Dozens of curious camels surrounded our car sniffing our salty clothes. 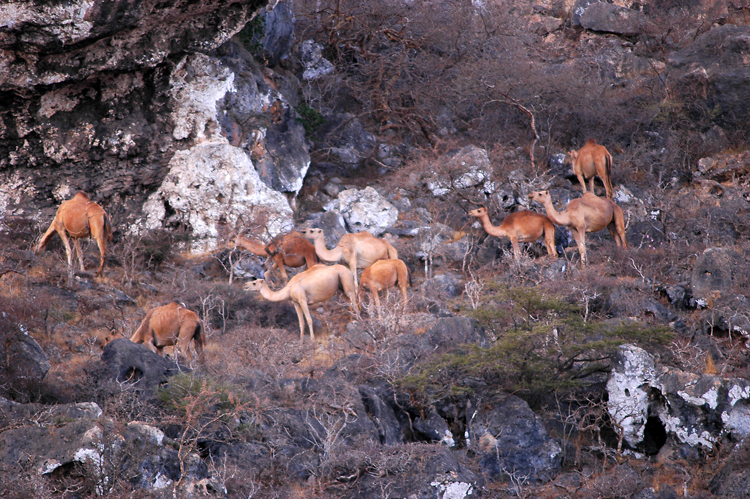 Up on the hillside, another herd munched on thorny acacia branches. Their tough lips and tongues somehow survive the thorny meal. Camels aren't aggressive unless you mistreat them. They are curious and only slightly skittish. They usually look you over from head to toe, and then they ignore your presence. Wherever you travel around the Red Sea, you will encounter apparently untended herds of camels. But don't make the mistake of thinking they are wild. When you look at their head and neck you'll find a brand or a tag in their ear that identifies their owner. If they ever create an Olympic event in synchronized staring, camels will be the hands down winners. Camels excel in synchronized staring. If you meet up in the desert with twelve battalions of wild camels, in unison, they will stare you down. This curious camel was an outlier, but even when separated from the rest of the herd, an unrelenting stare is still the order of the day. Camels are beautiful in a homely sort of way. They can open and close their nostrils at will, and when sand storms are blowing they can shut their nostrils down until the second that they take a breath. 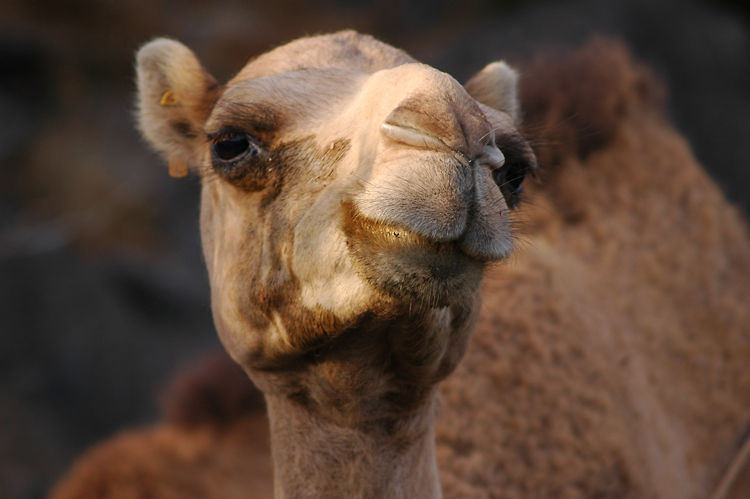 Camels have large lashes to protect their eyes from blowing debris, and they have a membrane that they can slide over the surface of their eye to keep dust and sand out of their eye during a sand storm. 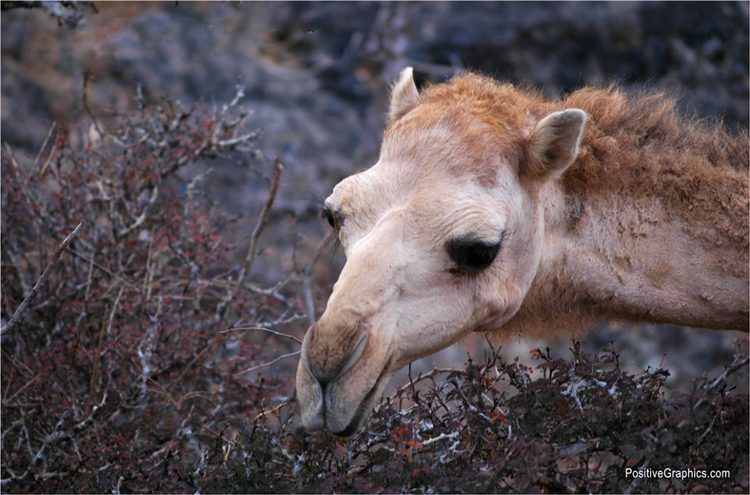 Camels eat acacia trees and bushes laced with spiny thorns. I wouldn't last fifteen minutes if I tried to eat those thorns, but the camels gobble them like like they are marshmallows. 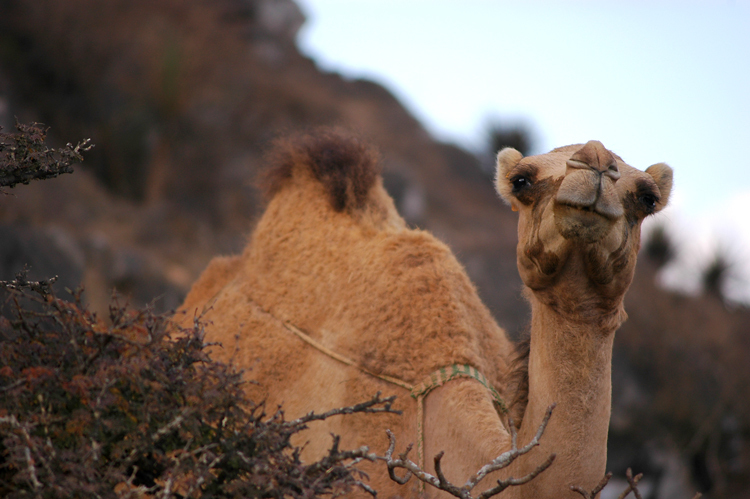 From the top of the head, to the hump on their back, to the tip of their "toes," camels are tough critters. It's no wonder they were so important to Bedouins who had to survive in the same harsh land by drinking their milk and eating their meat. You don't need to be afraid of camels unless you do something that hurts them. 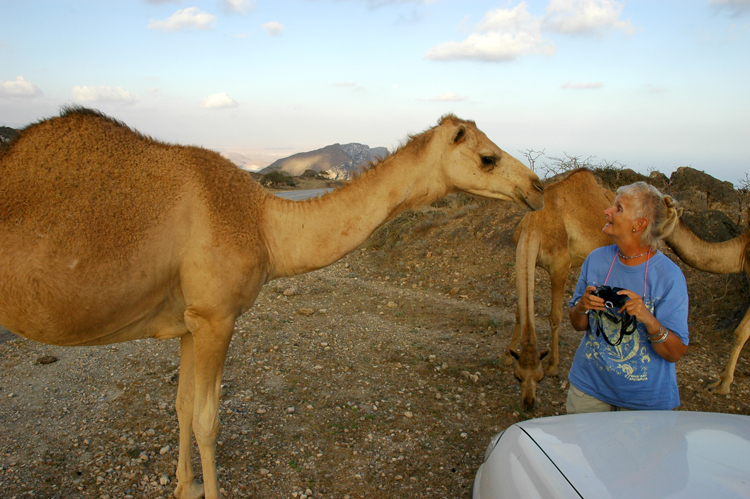 They are curious and non-aggressive animals that respond to gentle prodding, Saudis told me that if a camel ever attacks you, you should take your clothes off and sprint quickly away. Apparently the camels associate your smell with your clothes, and they will pulverize your clothes in vengeance while you make your escape. I have no personal experience with angry camels, but you can bet your bottom dollar that my clothes will be history if I ever meet up with a vengeful camel.